Beth Dooley: St. Pat's - A Crock! St. Pat's - A Crock! Dooley is not my name, it's my husband's. I took it for the melodious sound of Elizabeth Dooley, conjuring Eliza Doolittle, the heroine of My Fair Lady, who holds her own with such grace. I'm no Julie Andrews, but this winter, "All I want is a Room Somewhere / Far Away from the Cold Night Air," has been my refrain. Thus, like any convert, I've become more Irish than Kevin. The year we traipsed through his ancestor's homeland everyone assumed I was Irish, for my blue eyes, fair skin and loud laugh. So on St. Patrick's Day I pull out all the stops. But in Ireland, such celebrations are a total crock. It's a high, holy day in middle of Lent and recognizes the Irish saint, who drummed the snakes out of Ireland while helping the farmers plant their crops. On Crough Patrick, right outside Westport, pilgrims climb the steep slope saying the rosary on the way to worship in the little cathedral at the top. 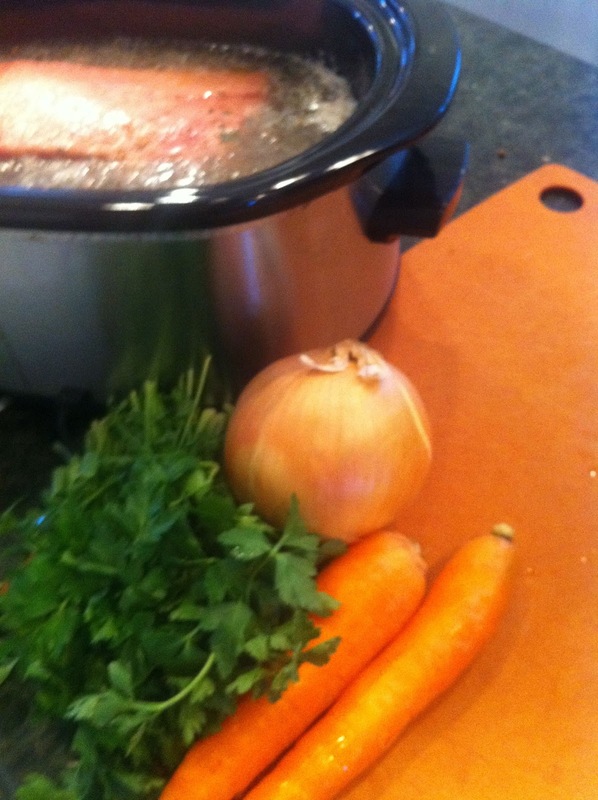 Dinner is a simple roast salmon or lamb stew served with nary a dram. In the States, the first St. Patrick's Day parade, held in New York City, 1848, organized by the Irish Aid Societies, connected the Irish with their countrymen and soon Chicago, St. Louis, Boston, all followed suit. Other immigrant groups jumped in -- the Italians, Poles, Jews -- as a means of protesting the discrimination they suffered. Of course, afterwards, everyone headed to the pub. The traditional feast -- corned beef, vegetables and soda bread -- is great stuff, today. Look for naturally pickled beef (uncured), not that nasty pink stuff, but grass fed brisket. Simmered in beer with aromatic vegetables, it cooks up to be tender and tangy. Leftovers are great on thick slices of soda bread sandwiches the next day. Serve this thinly sliced with plenty of the vegetables and potatoes and thick slices of soda bread to mop up all the juices. 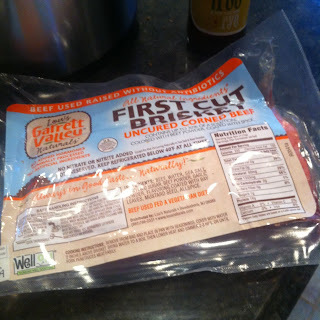 Remove the beef and the seasoning from the package and place in a crock pot or stew pot. Add the beer, bay leaf, pepper corns, mustard seed, onion and 2 carrots. Cover. Turn the crock pot to high, or set the stew pot over a low flame. Simmer the beef 4 hours, until a can be easily inserted into the center. Remove the beer, tent and set aside. Cut the 2 carrots into large chunks and add them along with the turnips, potatoes and cabbage into the crock pot or stew pot and cook until tender, about 15 to 20 minutes. Preheat the broiler. In a small dish, whisk together the honey and mustard. Place the meat on a broiling pan and brush the honey-mustard over the top. Run the meat under the broiler until the glaze is nicely browned and bubbly, about 3 to 5 minutes. Slice this thickly and spread with lots of butter. It’s great for sopping up all the juices from the corned beef and Colannon. Preheat the oven to 375 degrees F. Lightly grease a large baking sheet. In a large bowl, whisk together the flours, sugar, baking powder, salt. Using a pastry cutter or your fingers, work in the butter until it form s coarse crumbs. In a small bowl, whisk together the buttermilk and egg. Stir the wet mixture into the dry one until they form a moist dough. Stir in the craisins and caraway. Turn the dough out onto a lightly floured surface. Shape into 2 3-inch rounds and set on the greased baking sheet. With a sharp knife, cut a small x into the top of each loaf. Bake the loaves until golden brown and firm about 30 to 35 minutes. Remove and allow to cool about 10 minutes before serving. Minnesota's Bounty: The Farmers Market Cookbook!